Easily create blanket, glove or block molds! Odorless, Non Toxic. FDA Compliant, Food Grade. 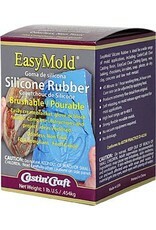 EasyMold Silicone Rubber is ideal for a wide range of mold applications, including Castin’Craft Clear Casting Resin, EasyCast Clear Casting Epoxy, wax, baking, chocolates, ice cubes, soap, plaster, air dry clay, concrete and low melt metals! 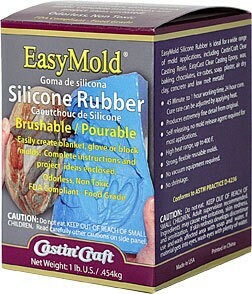 EasyMold Silicone Rubber is a easy to use, odor free, non-toxic, two component silicone rubber. 45 Minute to 1 hour working time, 24 hour cure. Cure rate can be adjusted by applying heat. Produces extremely fine detail from original, no shrinkage. Self releasing, no mold release agent required for most applications. High heat range, up to 400º F.